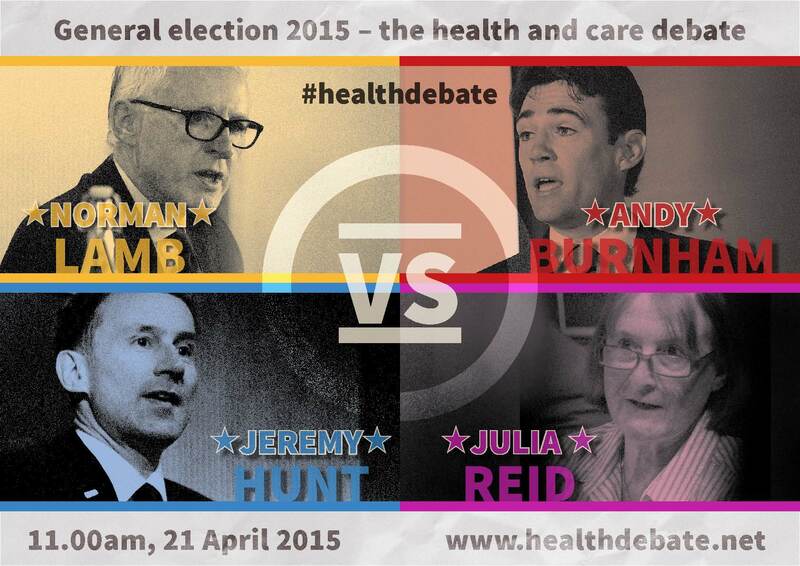 The BMJ was live blogging from the Health and Care debate at the British Library. Jeremy Hunt, Secretary of State for Health, Andy Burnham, Shadow Heath Secretary, Norman Lamb, Minister of State for Care and Support, and Julia Reid, UKIP Deputy Health Spokesman, answered questions at the debate chaired by Sarah Montague from the BBC. 11:00 – The auditorium is full with an audience of 200 people. Waiting for the speakers to arrive. 11.10 – The speakers have arrived. Jeremy Hunt still on his way. 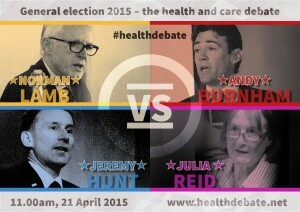 11.13 – Burnham opens the debate. Labour’s 21st century ambition for the NHS will only be achieved if we call time on the market experiment on the NHS. Markets deliver fragmentation and extra costs. Labour will repeal the Health and Social Care Act. Labour will change the way the NHS spends money. We need to move away from hospital based care and make home the default setting for care. Finally we need to invest in the workforce and ask the NHS to lift up social care. 11.16 – Jeremy Hunt has arrived. 11.16 – Lamb on NHS finances: The Lib Dems call on all the parties to set up a non partisan commission to work with the public and patient groups. He says we need to improve mental health care. End the discrimination at the heart of the NHS and improve access to mental health treatment. Shift to a joined up and integrated model of care. Lib Dems would have a department for health and care. 11.20 – Hunt goes next. The NHS has dealt with a triple whammy of an ageing population, Mid Staffs and a lack of funding. He says that the NHS has weathered this storm. But going forward there is a huge challenge. The NHS needs funding. The Conservatives are prepared to put that funding into the NHS on the back of a strong economy. 11.22 – Reid says that UKIP are committed to keeping the NHS free at point of care from cradle to grave. UKIP are committed to putting £3 billion a year into the NHS. UKIP are committed to banning zero hours contracts and they want carers to be paid for journey times between patients. They want carers to spend a minimum of 30 minutes with each patient. UKIP are committed to the NHS being a “national” health service, not an “international” health service. 11.25 – a question from the audience. Kailash Chand asks, how will each party stop playing games with who is providing care and ensure it is publicly funded? Burnham replies: The market experiment cannot continue. It will break apart the NHS. Evidence from around the world shows that market based healthcare systems cost more than national systems. That is why Labour will repeal the Health and Social Care Act. Another question from the audience: Are you confident that the amount of money you want to pledge for the NHS is sufficient for the quality of care that you want to deliver? Hunt replies: He worries about the public and private debate when the real issue is patient care as shown by the example of Mid Staffs. He says you can be confident about putting sufficient funding into the NHS if the economy is strong. Burnham says that the NHS is in the grip of expensive private funding agencies because the Coalition government have cut staffing. He says fundamental changes must be made to the way that money is spent on the NHS. The NHS must be incentivised to treat people in their own homes. Hunt replies, the funding gap is £30 billion. £22 billion can be found through efficiency savings. Lamb says if we cut further on care, then this funding gap will become bigger than £30 bn. Social care is critical here. Lamb says we must commit to a non-partisan committee for health and care, asks others to commit. Burnham says he’ll commit to this once Health and Social Care Act is repealed. 11:38– Reid says that UKIP won’t sign TTIP. She says UKIP are with Burnham in repealing Health and Social Care Act. When it comes to funding, UKIP want to cut down on the burgeoning numbers of managers and targets, which drive up admin costs. 11:41– Anita Charlesworth from the Health Foundation says if we are to retain stability, then how can we make efficiency savings. Another member of the audience asks how the parties plan to make patient involvement a reality. Lamb says we have to shift from a paternalistic system in healthcare. We need to enable more self-care for patients, e.g. in diabetes. Hunt agrees with Lamb, says if we are to transform care for long term conditions, patients need to be in the driving seat. 11:45– Hunt says patients must know where the buck stops so clinicians are more accountable. Burnham has his say. He says patients must have certain rights enshrined and more support. 11:48– Burnham says NHS needs to change for the 21st century, and this means changing public expectations of what the NHS does. 11:49– Hunt says it’s a question of culture, system is too focussed on targets. 11:53: Reid says that clinicians are in the best place to know what’s best for patients. UKIP want to bring in county health boards. 11:54 Audience member brings up the recent changes in Greater Manchester. Montague says to Hunt is the plan to do this for more of the UK? Hunt says how things are handled in each area will vary. He says in some areas local councils are the obvious organisations to take the lead, in others that may be acute hospitals. It’s not politicians job to say who the provider should be in each area. 11:55– Burnham says he has misgivings for what’s happening in Greater Manchester, it’s just creating another level of admin. 11:57– Hunt says Burnham wants to have it both ways: he wants more local freedom but against what’s happening in Manchester. 11:58– Lamb says we should not impose a single model from the centre. He says we must have clear national standards, which means equal access everywhere, but this doesn’t rule out different models in different areas. 12:00– Another audience question: Where does public health fit into plans e.g. sexual health and how can it be protected? Lamb says this area could be ring fenced. Reid agrees with Lamb that this should be ring fenced. Burnham says this question exposes the flaw in the current government: local budgets have been raided and public health has lost out. Hunt brings up prevention as the thing we need to focus on in public health. 12.04 – Mark Porter from the BMA: The NHS efficiency drive was paid for by the workforce. How will each party value staff at the heart of the service and commit to no more real terms pay cuts for NHS staff? Reid: We’ve seen how managers have given themselves pay rises whilst those at the coalface have taken cuts. UKIP are committed to increasing the numbers of doctors and nurses. Agrees that real terms pay cuts need to be addressed. Hunt: He says he has never seen anyone ever work harder than NHS staff. He would pay them as generously as possible but only if that didn’t lead to laying off staff. It’s also about support, not just pay. It’s also a question of boosting staff morale, especially in the community. We need more district and community nurses. But he won’t commit to no more real terms pay cuts. The Conservatives are committing to more staff as well as paying fairly. Burnham: This is an area where the Coalition have got things wrong. NHS staff see a fortune going out to agencies and overseas recruitment. That is why morale is low. He says he can commit to no more real terms pay cuts. We need an independent process to ensure fairness in pay from bottom to top. Lamb: Says that as wage rates rise in a growing economy then staff pay in the NHS will have to increase. Lamb says he totally agrees that there are too many agency nurses, who cost the NHS too much money. Burnham says that real terms pay cuts forces nurses to go to agencies. The NHS needs to look after the workforce that it has. Hunt says it would have been irresponsible to increase staff wages as it could have led to between 6000 – 14,000 nurses being laid off. 12:15 – a question from the audience. Where do the political parties think that more doctors will come from given that there are vacancies on training courses, and GPs are currently leaving posts? Hunt: He thinks that general practice needs extra funding. Graduates need to see that general practice is the most exciting area to work in. The most attractive thing about being a GP is seeing the same patients over many years. This needs to be built upon to make general practice an attractive place to work. Burnham responds: The profession are utterly demoralised from changes in the NHS. This has to be turned around. It can only be done by giving younger doctors new models of care to work in. He agrees that it is a huge challenge. Lamb: He thinks that the model is somewhat broken. GPs are working under enormous pressure. He agrees with Hunt. The role of a GP needs to be made more attractive to younger doctors. Time could be freed up using e-health. Reid: GP practices have to cope with far more patients due to a large influx of people. It is difficult to get an appointment and therefore impossible to see the same GP. 12.22 – a question from Nigel Edwards. He believes it isn’t only pay, but also the pace of work that is driving staff out of the NHS. We haven’t got to the bottom of how we pay for a seven day NHS with more staff. Getting rid of non clinical staff isn’t the solution. We need clinicians with time and skills to engage with the service. Dave Stewart, a recently retired clinician: Would you agree to a referendum to decide how much tax should be paid to support the system? Hunt says that is what the general election is as each party is making pledges for NHS funding. The Conservatives would increase funding without increasing taxes. Burnham: If Conservatives won’t increase taxes, that means money will come from spending cuts. Labour are the only party with a funding plan. They would pay for their plan with a mansion tax. But there will come a point when we have to debate, how will social care be funded? Reid: UKIP would support a referendum. Lamb: Nervous about a referendum on this subject. But his big worry about the Conservatives is that their plans are all based on cuts. Hunt responds that the Conservatives would fund their plans from a strong economy, not just spending cuts. 12: 30 – a question from the audience: How are you going to ensure that mental health is given equal treatment as physical health? Lamb: He says that we must have equality of timely access to services for mental health. Burnham: Mental health services have been cut. These cuts have to stop. Can’t carry on cutting mental health and expect services to be there for people. This is also about providing therapy, CBT, bereavement counselling, not just medication. Lamb asks why did Labour implement maximum waiting times for physical health but not mental health? Hunt would do three things: integrate physical and mental health treatment, put more funding into mental health to improve waiting times for mental health services. Finally much more needs to be done to tackle stigma around mental health. Reid: UKIP also believes that physical and mental health should be treated equally. They would put more money into mental health to address this. Each of the speakers is now going to speak for a minute to sum up the debate. Hunt: The safest, most compassionate healthcare service in the world is his vision for the NHS. He sees an NHS that wants to put quality and safety of care at its centre. This can only be done with proper funding. The Conservatives are the only party who can do this off the back of a strong economy. Burnham: He is clear about one thing. The NHS cannot go through another five years like the last five years. Staff on the ground are struggling. Spending cuts are at the root of this. We urgently need to take politics out of the NHS by repealing the Health and Social Care Act. We need to give back hope to the NHS. Lamb: This is a time of considerable risk but also opportunity. We need a commitment to investment for the NHS. Mental health has to be treated equally. Reid: UKIP are the only party who can fully fund their promises on the NHS as shown by their manifesto. They would increase investment into the NHS without increasing taxes.